After mamluks were converted to Islam, they were trained as cavalry soldiers. Mamluks were to follow the dictates of furusiyya, a code of conduct that included values like courage and generosity but also doctrine of cavalry tactics, horsemanship, archery, and treatment of wounds. These Toassin Mamluks are extremely skilled horsemen and archers and are some of the best that can be found in the world. 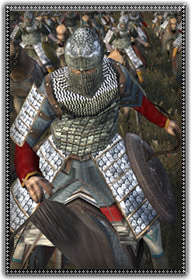 They are covered in heavy armor and are armed with a powerful composite bow and a melee weapon should they need it.